Young business woman on gray background. Female manager presenting new project at conference using digital tablet. 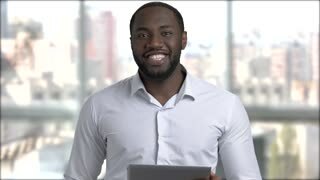 Attractive Afro American manager with pc tablet. Confident dark-skinned man in formal wear holding digital tablet and talking. Discussing new project. Attractive manager is talking on chroma key background. Handsome Afro-American businessman speaking at the conference using pc tablet. 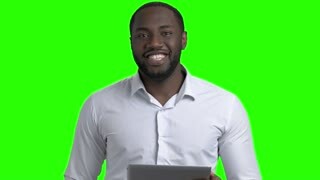 Afro-american business trainer on green screen. Dark-skinned manager in white shirt holding digital tablet and talking to camera. Stylish businessman using digital tablet. Young successful afro-american manager reading news on pc tablet on grey background. Black manager playing game on pc tablet. Stylish afro-american businessman playing online game on digital tablet on grey background.